Sixteen years ago, Scotsman Jim Weir, headed to The Hague to consult on a painting project and is still here 14 years later. By accident. I had just finished work in Germany and was on my way back to Scotland when my agent asked me to do a small job in Rotterdam. Being there, I was asked to solve a problem on a project in The Hague. I did not really fancy going there but thought I could not refuse. That decision changed my life as I met my soulmate on 9-9-1999. She is now my wife and life changed for the better for me. Once and for all I am a mad Scotsman who is crazy about football, but when Holland play I turn into a mad Dutchman. For the rest of my life. 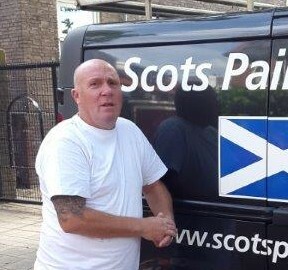 I love living in Haarlem and have set up my own company, Scots Painting, which both of us are really proud of. I did try to learn it but since I speak fluent German I tend to use a lot of German words, which the Dutch do not appreciate, so I gave up. Most clients speak Dutch to me (I understand it for 99%) and I speak back in my Sean Connery accent, which they all seem to love. I’d like to say saté but that’s Indonesian. Erwtensoep is always welcome, especially in wintertime. I miss my family and friends, the mountains and Glasgow Rangers. Most of all I miss Saturday afternoons, spent in the pub with friends watching football and having a good time. Sometimes I think I’m Dutch but then realise I am the only one stopping for a red traffic light. I just love Haarlem, especially the Vijfhoek. There’s so much to see and do. Most of the Dutch are laid-back, but it can anger me when they do not acknowledge you for letting them go first. After all it’s nice to be nice. Get all my friends together in my favourite pub (de Vijfhoek) to have a great party with them paying ….. then I’d cry all the way to Schiphol Airport.